Marine Sharpshooter is the latest game from developers Groove that puts the gamer in the role of an elite marine fighter for the CTU (Counter Terrorist Unit) that must now put their life on the line in order to save the world from nuclear terrorists. Fortunately for you, you have a marine spotter to back you up and of course your trusty high powered rifle to help serve justice. Unlike the current games on the market at the moment, Marine Sharpshooter isn't based in a long forgotten war or a game that is set on an alien world... but far from it actually. 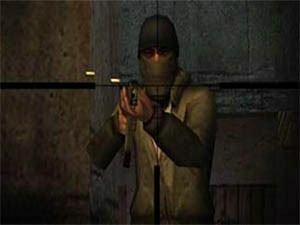 The game is set in the present and your character only has access to three different weapons that include a gun, a knife and a rifle. The game is combination of strategy meets first person shooter and perfectly links both genres into this title. You also have access to a spotter who sits in the distance and observes your mission, discreetly giving you advice on where the enemy is located. The gamer can also control the spotter and you can give him orders that include hold, follow, fire or cease fire. The spotter is like your ears and eyes in the deadly world of sharp shooting. Fortunately your spotter isn't born stupid and follows a professionally created A.I. script to keep himself out of trouble. Unfortunately this is not always the case. 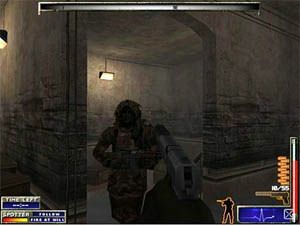 The combat of Marine Sharpshooter is relatively straight forward as many of the missions require stealth and subterfuge to complete. For the most part, the A.I. performs like highly skilled trained soldiers but sometimes they do "glitch" and just stand there, even when you are in shooting distance. 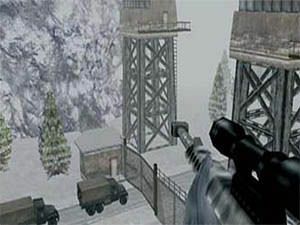 The game also contain over 10 different missions that range from a variety of locales that include Afghanistan and Chechnya. Another realistic feature of the game is that the weapons used in the game are actual real world weapons that include the high powered M40A3, the deadly M821A1 and the sleek AW. The control system of the game uses a combination of the mouse to move your character and their weapons around plus the keyboard to help move your marine in the gaming environment. You will generally find yourself using the sniper rifle the most in the game and it is probably one of the more realistic "sniper" effects to have been implemented into a game. The unfortunate aspect of the game is that when you accidentally do mess up, you must rely on your pistol to get you out of trouble. Graphically, Marine Sharpshooter contains some beautiful character models with realistic textures and facial details that is up there with the best of first person shooters. The gaming environment of the game is unfortunately a little dull and contains a minimum amount of detail. The textures on the buildings and outdoors, although looks realistic is unfortunately very sparse. The musical score of Marine Sharpshooter is a little on the MIDI side but fortunately it is relegated to the background of this game. Don't get me wrong, the music isn't bad, it just nicely sits in the background to help with the atmosphere of the game. The sound effects on the other hand features all the sounds of firearms, bullets inflicting serious damage and of course some professional voice acting to help keep the game entertaining. 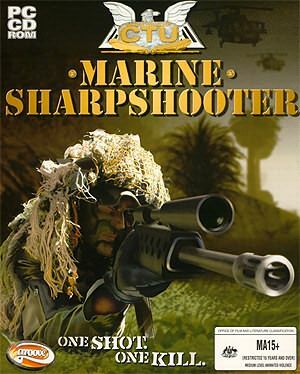 In conclusion, Marine Sharpshooter is an entertaining game that does help break the monotony of games such as Halo or Call of Duty. Although not on the same par as these two games, Marine Sharpshooter has enough going for it to keep you enthralled in this world of deadly sharpshooting. With some nice graphics and decent sound effects and with an extremely affordable price tag, this game will definitely find a home among the gamers of the world. I almost forgot to mention that the specifications of this game require the most minimal powered PC to run.